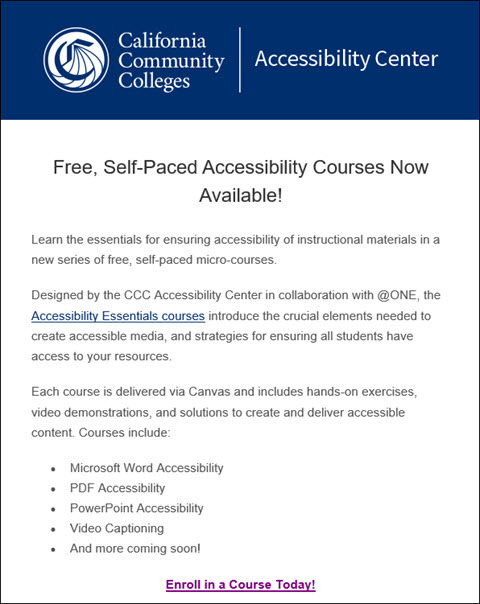 Take advantage of some wonderful opportunities to learn more about making your course content accessible! This is the self-paced version of ACCA where you can choose your learning pace. You will receive a certificate of completion at the end. Includes information about creating accessible Microsoft documents and more. Request Blackboard Ally for all of your Canvas courses by filling out the Ally Pilot Opt-In Request Form.